When I am choosing fabrics for a quilt, unless I am using fabrics from only one collection (like when I just pull from my stash), I feel like I sometimes get stuck in a rut. I guess we all gravitate toward our favorite color combos, and my favorites usually involve greens, blues, and aquas. With my latest quilt, I really set out to try a palette that I've never done before, with colors that I don't often see together, and as the title suggests, I wanted to pull completely from my stash. When I first pulled these fabrics, I wasn't sure I could get used to them, but the more I work with these rich hues, the more I like them. Since the prints themselves are all small and tonal, I wanted to make sure there was plenty of interest in the color variation. I almost substituted the lightest aqua and the lightest orange fabrics, but I wanted to keep the quilt from being too matchy. I think having the different shades of each color adds depth to the quilt. The bright sunshine is wonderful for showing off those colors, but it seems to magnify every little wrinkle. I was so excited to get a photo of the blocks all put together, I didn't even bother pressing the top beforehand, so you'll have to excuse the wrinkles. This is my latest pattern, and I've decided to call it Pop Star, since the stars literally look like they're popping open. It's another design that's been hanging around in my sketch book for awhile, and the fact that it is finally taking shape makes me so happy! Colors are gorgeous! Now on to the quilting.... do you have a favorite batting you like to use? Your fabrics are just wonderful! They would make a perfect bundle!! I love it! I usually gravitate toward blues, greens, and aquas as well. The different shades of orange/coral really compliment the blues and purples nicely. Lovely pattern. Those colors would be a stretch for me, too, but they look great -- wrinkles and all! Very cute! You do well outside of your comfort zone. What a great color combination! I loved it the minute your blog opened. It isn't something I would have thought to use, but now I will. Thank you for all of the great inspiration you provide! Great pattern. Love the fabrics together! Wonderful pattern. And the colours are perfect, I absolutely love turquoise combined with orange. What a beauty! I love the color combination. I always have a hard time putting color combinations together, eventually I get there! Well done, its really striking! Gorgeous!!!!! Great name! I think something with a swirl, would add some movement, but anything is going to work, your quilt is fantastic!! A simple but dramatic pattern, looks great. I love the colors you chose. Lovely p-attern, great color choices! Your new stars are very pretty and those rich colors are awesome. Excellent! Wow! I love this entire post! The colors are just radiant together and the block is awesome! So glad I found your wonderful blog today!!! Love those bright colors with the white. Nice. It's good to step out of our comfort zones and try new things - this is a winner! I love your pattern, too, and I'm thinking I have some fabrics of my own that will pop with it. Can't wait for you to publish. But wait! I need to do up Bubble Bath first. Ah, so many ideas and so little time . . . .
You are on fire lately! 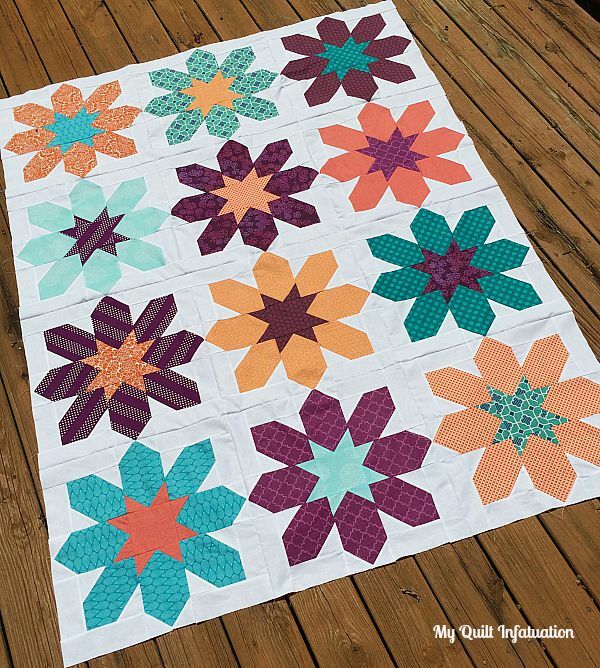 Fun colors and a fun quilt! Turned out beautifully. I find it kind of hard to switch up my color palette too.